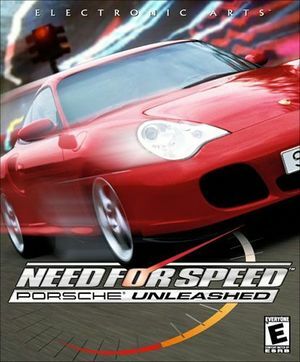 Released as Need for Speed: Porsche 2000 outside North America. The game is unplayable without patches on new systems. See NFS5 Essentials. NFS5 Essentials is essential to play the game on new systems. 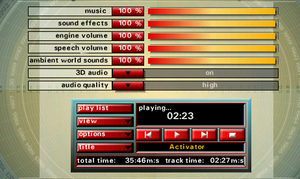 It also adds the 4 official downloadable cars and enhances graphics. Force in the graphics card control panel. Menu FPS unlocked, race FPS locked at about ~93 fps. Click on File, then Import. Import Need for Speed 5 Porsche Unleashed.dxw from the exports folder. Set the path to <path-to-game>\Porsche.exe. Open the MS folder and copy the contents to the installation folder. Click on "Add" and choose the installation folder. Go to the DirectX tab. Uncheck "Application controlled fullscreen/windowed state"
Mouse is not used during gameplay. When using a controller, frame-rate may drop significantly in main-menu. On Windows 8 and higher, USB controller (wheel and gamepad) analog inputs register according to the options menu, but will not function in-game as the default controller cannot be set. A temporary workaround involves plugging the controller to a USB 2.0 slot and other peripherals into a USB 3.0 or higher slot. This is due to how the game treats device priorities, relocating the controller to the top of the default controller list. This ceases to work on the next PC start-up, locking the steering to the left and disabling all controller input except for Acceleration. Extract it and place it in a convenient place. Start dgVoodooSetup.exe and configure it. Select Virtual 3D Accelerated Card under Videocard and set its RAM to 65536 kB. Now go to MS folder in dgVoodoo's directory and copy D3DImm.dll and DDraw.dll. Go to the <path-to-game>\ and paste the files in there. Running game in vista (no service pack) + administrator compatibility should do the trick. Remove all the files in the folder. Go to the root folder of the CD. Go to nGlide compatibility page. Find Need For Speed 5: Porsche Unleashed on the list and download a fix for it. Extract the fix and run PatchInstall.bat to apply the EmulateHeap attribute. Do not run nfs5.reg unless using the nGlide wrapper for this game. In game, go to Options. 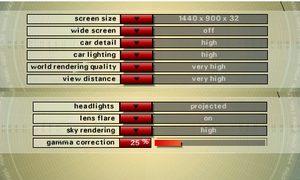 Go to Graphics tab and go to Advanced Settings. If turning off Lens Flare doesn't do the trick, turn off the rear view mirror as well (F6 in race). Make a copy of Forest.bin and name that copy Farmland.bin. This page was last edited on 20 April 2019, at 08:22.